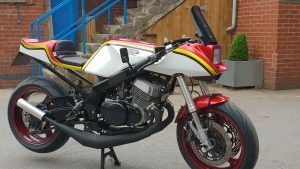 This bike is built up from parts from many other bikes, to name a few the frame is GS500. 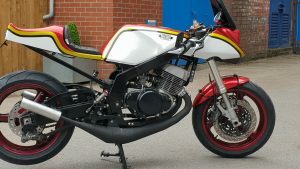 The engine is a 1970s Suzuki T500 that has been tuned by Mick Abbey to run his own make of pipes as well as flat slide carbs giving a power increase of approximately 25% of the standard engine. The front wheel is a GSXR750 SRAD, forks are a Kawasaki ZX10R. The callipers are a R1 monoblock, as well as a GSXR1000K7 master cylinder. The rear end is a machined down GSXR1100W swinging arm and wheel running a 180 rear tyre. the shock is off a Yamaha R6 as well as linkages from both a SV650 and GSXR400 combined. 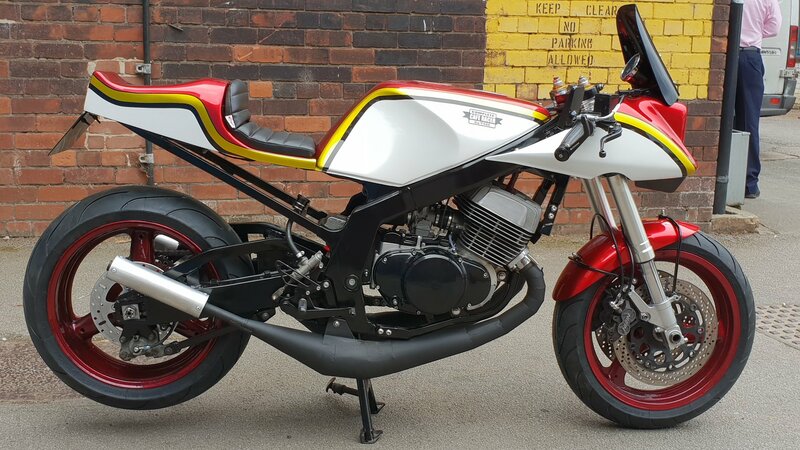 The tank is made up of several GS500 tanks with an internal oil tank hence the two filler caps, lengthened at the sides to suit the line of the seat which was designed and now made in house for this bike. 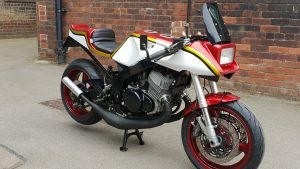 The fairing is a heavily modified Katana 1100 on homemade brackets and mounts. 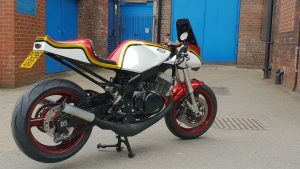 The paintwork is done in house and paint is supplied by Specialist Paints in Sheffield. Candy ruby red, candy gold as well as sparkle pearl silver finished with 4 and a half litres of show clear. The bike goes as well as it looks and handles like a dream.